Every week, usually at the end of the day on Friday, we havea conference with our Lead Flight Director, Dina Contella. At the startof this week’s conference, she put the week into perspective. She saidthis time last week (our conference was on a Thursday because of HTV arrival onFriday) HTV had not docked, 47 Progress was in a standby position waiting tore-dock (which it did and then departed for good), 48 Progress had not launched(it is now attached to the Station), nothing had been unloaded or packed on HTVand we had approximately 40 hours of science to do. Sometimes we get socaught up in working day to day we don’t realize what can be accomplished in aweek. I think everyone can agree it was a productive week. Even with all the work we had to do, we found time to gettogether and watch the Olympics. Of course everyone knows there issomething special about the Olympics and that feeling is not lost inspace. We were able to see Michael Phelps become the most decoratedOlympian and Gabby Douglas’ nerves of steel as she won the individualGymnastics gold medal. If you have read any of my previous blogs, youknow that I enjoy my sports. To have two weeks to watch the best athletesof the world compete is a dream come true for any sports enthusiast. Towatch them while orbiting above the Earth makes them even more special for us(even though we often miss the end of a competition because we lose satellitecoverage). I have noticed two things while watching these games. One is that no matter what the sport or which country is winning, we allappreciate the efforts of the athletes and acknowledge their abilities. We truly have an international crew on the ISS: three Russian cosmonauts, one Japaneseastronaut and two American astronauts (one of Indian descent and one of PuertoRican descent). While we work together as one team we still maintain ournational pride. Just like watching a basketball game with your buddy thatis from a different city, we give each other a hard time but congratulate withsincerity the winning team or individual. It is easy to see why we dothis when you look out the window from the ISS. We all come from the sameplace, Planet Earth. The other aspect of the Olympics that makes even thenon-sports fan enjoy these games is the personal stories of the athletes. Each athlete has taken their unique path to the games, just as each of us walkson his own unique path. Even though we come from different places, we canall relate to many of the obstacles the athletes have faced and overcome. A common theme heard from all the athletes is their pride in representing theircountry and the hard work they have put in. 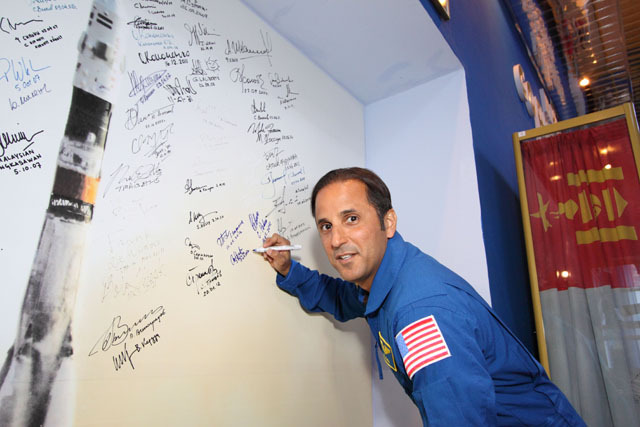 I understand as I am proud torepresent the United States and the Puerto Rican community as anAstronaut. Gennady, Yuri, and Sergey feel the same about Russia; as doesAki with Japan and Suni with the US and India. However, you don’t need tobe an Astronaut or an Olympian to be proud of where you come from or what you do. As a school teacher, I was proud of the work I did to help develop our futureleaders. I think watching the Olympics reminds usthat we share one planet and that we can respect one another no matter what ourdifferences, yet at the same time we can be proud of who we are and what werepresent. I look forward to another week of great competition andsportsmanship and of course work. We have a lot of cool things plannedfor this week. Keep an eye out for Curiosity. Joe’s blog also appears at http://www.fragileoasis.org/bloggernauts/joe-acaba/posts/. Another milestone of our Expedition has been completed – thearrival of HTV3 and the undocking and redocking of 47P (Russian Progressvehicle). What you quickly realize here is that the passing of amilestone is quickly followed by the approach of another. Today, Sunday,we will relax and enjoy a day of rest. Tomorrow we will begin preparationfor the final departure of Progress 47P, the arrival of Progress 48P, the longtask of unloading and then loading HTV3 and the upcoming Russian and US Spacewalksfollowed by HTV3 departure and then my trip home. As you can see it is anever ending string of diverse activities. I am commonly asked “What is a typical day like on theISS? What do you do every day?” These are difficult questions toanswer. I can say that there are a few constants in my day. Iusually wake up around 6am; clean myself up, have breakfast, lunch and dinnerand somewhere in between workout before going to bed around 10pm. It iswhat occurs around those activities that makes this job interesting,challenging, stressful and fun. Diversity. If you are someone thatlikes to know what you are going to be doing every day, this job would driveyou crazy. On Saturdays, we get a general idea of what we will be doingduring the upcoming week. Here are few of the things I have done in thepast 2 weeks since I have written last. Various science experiments,Soyuz seat fit check, 31 Soyuz arrival with the new crew, HTV3 preparation(actually flying the arm to practice grappling the vehicle and lots simulatortime), public affairs interviews and recordings, HAM radio contacts, toiletmaintenance (I am now very familiar with our system), emergency simulationswith the crew and the mission control centers, periodic medical exams (bothphysical and mental), controlled diets, ARED (exercise device) maintenance,urine bag usage (again), blood draws (both as a subject and operator), airquality monitoring, transfer and consolidation of supplies, filter cleaning(which means vacuuming), ultrasounds (again, both as a subject and anoperator), and the capture and berthing of HTV3. Our planners and flightcontrol teams have a tough job. On any given day, you can go from conducting a technicalscience experiment, to talking to school kids, to vacuuming, to drawing bloodfrom a crew mate. The tasks range from things I would do at home on aSunday morning (no, not drawing blood) to grappling a visiting vehicle loadedwith supplies with a robotic arm. While some are more exciting thanothers, because of the environment we are working in all require mentalfocus. I just received an email from a friend of mine that recentlyreturned from a 10-day canoe trip in Alaska. Everything did not go as plannedand there were quite a few unexpected surprises, which make for a greatadventure. While he had the best time, when he finally got off the riverhe was not only physically tired but mentally exhausted. I told him thatworking on the ISS is kind of like his river trip. You have the best laidout plan but unexpected things happen that get your heart pumping. Youadjust and problem-solve and have the best time of your life. After arelaxing Sunday watching the Olympics, we will be ready to start up all overagain and see what adventures await us. Our time of solitude is rapidly coming to an end. Ournew crew mates successfully launched very early this morning. With the 2days they spend in autonomous flight to reach us, they will arrive around 4 am * on July 17. All of the preparations have been made for theirarrival. 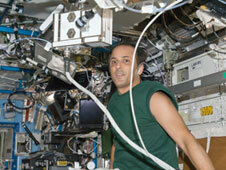 Since it was not too long ago that I arrived, I clearly rememberthose first few days on the ISS. While the traditional hatch opening andhaving the opportunity to talk with family and friends that made the trip toRussia are wonderful experiences, I remember being tired and wantingdesperately to take a “bath” and put on some regular clean clothes. Whilewe do have facilities on the Soyuz and lots of opportunities to take cat naps,it sure was nice to be home on the relatively spacious Space Station. While all of the new crew members have been here before, we will do all we canto make the transition as comfortable as possible. For Gennady, Sergeyand I, we will begin another sleep shift tomorrow. We will wake up at ournormal time of 6 am and are scheduled to go to sleep at 3:30 pm with a wake upat midnight. The day of docking is a long day for all of the crews and wewill be back to a normal schedule on Wednesday. 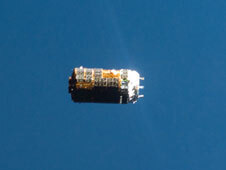 As I mentionedpreviously, HTV will be arriving 10 days later so we will all hit the roadrunning. Knowing what is ahead, Gennady, Sergey and I thoroughlyenjoyed the weekend. While some work had to be done, overall it was anopportunity for us to recharge our personal batteries and just enjoy thetime. 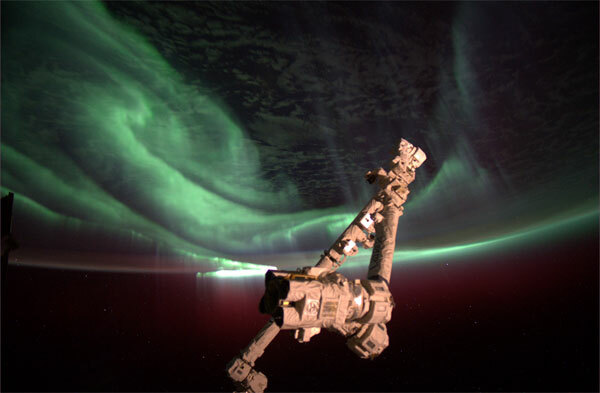 We were rewarded with the results of the recent solar activity –the southern lights. I remember seeing the auroras during my Shuttleflight and I thought it was the coolest thing. Then I arrived this timeand Don Pettit showed me the auroras and they were much, much better than whatI seen previously. I was happy as could be. Then on Saturday, I wasworking out and in between sets I saw that we were heading south during a nightpass. So I decided my workout could be postponed for a few minutes and Iturned out all of the lights in Node 3. Within a couple of minutes, Icould not believe what I was seeing. It was absolutely incredible. I enjoyed the show for a few minutes and then felt I had to inform my crewmates so they could also take in the view. Even Gennady, with all of histime on orbit, was amazed. I am no expert with a camera but I tried tocapture at least a small reminder of the experience. The pictures werenot great, but they would do. So today, at around the same time of day, Ithought I would take one more look. Just when you think it can’t get muchbetter, it gets way better. I of course took some obligatory pictures,but then I just sat in the dark, in the peace and quiet of this incredible manmade, orbiting laboratory and just looked out the window in awe. What atruly magnificent planet we live on and solar system we live in. I couldnot have asked for a better way to mark the middle of my Expedition and tostart what will be a challenging and rewarding time on the International SpaceStation. 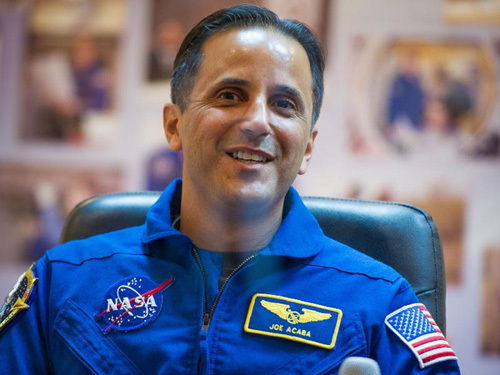 * Since astronaut Joe Acaba is writing from the International Space Station, the time references in this post are GMT. 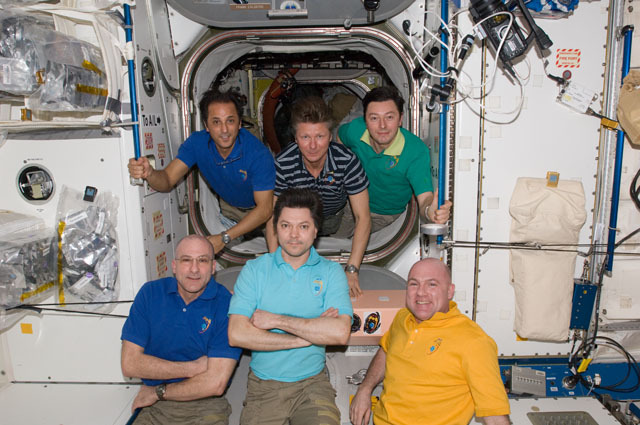 Expedition 31 crew members pose for a photo in the Unity node of the International Space Station. Pictured on the front row are Commander Oleg Kononenko (center), Andre Kuipers (right) and Don Pettit, both flight engineers. In the back row (from left) are Flight Engineers Joe Acaba, Gennady Padalka and Sergei Revin. It is hard to believe how quickly the time has gone by. My lack of blogging is directly proportional to how busy things have been. As I write this, I am one of the three people on the ISS and the only American. It is pretty cool. 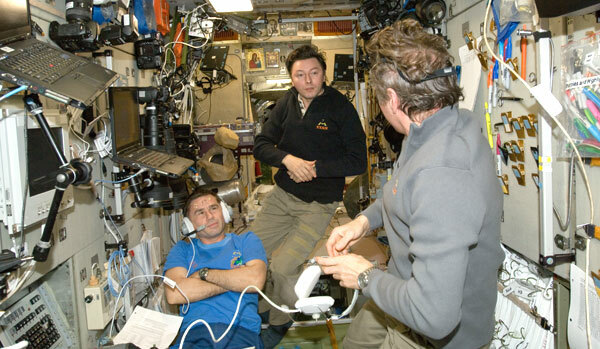 The other three members of Expedition 31 went home last Sunday morning with an undocking around 4 am. It was sad to see them go. Anytime you experience a unique situation with someone, a certain bond is forged. It was the same with the friends I made as a Peace Corps Volunteer or crew members on my Space Shuttle flight (STS-119). I am sure you have friends like that. I will forever be grateful to Don, Andre and Oleg for the way we were received when we arrived, their sharing of experience, and for just being good friends. We had a great time working together. I wish them all the best as they get accustomed to life back on Earth. I know they were all anxious to get back to their families. There is a lot that needs to happen as you prepare to go home. The Soyuz is a small vehicle which would seem to make packing for return simple. However, with its small size comes the challenge of prioritizing items for return and making them all fit. Then crew members need to clean up their home for the past 6 months and consolidate all of the gear (both regular and electronic) they have been using. Don said his goal while cleaning up was that nobody would ever know he was here. Sorry Don, the impact you had on this Laboratory will never be forgotten. Somewhere in between all the work, you need to spend that quality time looking out the window and just enjoy the moment. No one knows if or when they might return to this unique Outpost. The 4 am undocking meant a sleep shift for the entire crew. It made for a long day for everyone. The departing crew still had another 4 hours until landing and then they start the long ride back to Houston. It is hard to imagine that within approximately 24 hours after undocking from the Space Station, one can be back at the Johnson Space Center in Houston. Gennady, Sergey, and I worked until approximately 9 am and then tried to get some rest. We shifted back and were on a normal work cycle starting Tuesday morning. I have heard many astronauts tell me that some of their favorite time on orbit was when there was a reduced crew size. It is an interesting situation. With only 3 people, we have more responsibilities. I can no longer ask Don or Andre where I might find a certain tool or what is the best way to access a certain piece of equipment. You hope you have learned what you need to get the job done. The great thing is that we have the Mission Control Centers guiding and helping us. Again, the importance of the team concept. However, there is something peaceful about waking up in the morning to a darkened Space Station and floating out of your crew quarters. At the end of a work day, you can spend time looking at Earth and getting lost in your thoughts. Or you can crank up the tunes and get in a great workout with Earth in the background and not have to worry about disturbing anybody. It is a great time for self reflection. I think I know what they meant about this time. I will enjoy these days because as busy as we have been up to now, things are going to get exciting soon. In the last half of my mission we will have of course the arrival of our new crew mates (we anxiously await the arrival of Suni, Aki, and Yuri on July 17). With a new crew come new enthusiasm, expertise, and many good memories, an undocking and re-docking then final undocking of a Progress vehicle, the arrival of HTV3, the arrival of another Progress, a Russian Spacewalk, and an American Spacewalk. I can’t wait. I was wired up last week and I don’t mean with adrenaline or caffeine. I had the blood pressure cuffs on my fingers (my crew mate Oleg was calling me Robo Joe) and the 10-lead holter monitor on my chest. The week ended up again with more urine samples and a blood draw. One thing this week has taught me is my appreciation of sports. It is not like I did not know that I am a sports fan. My game room in my house gives me away. However, I have learned that apart from appreciating the abilities of the players and the complexities of the various sports, I miss the social aspect of the games. Being from Southern California, I follow the Angels, Lakers, Kings, and Ducks. My relationship with the Dodgers is complex (a story for another day) and since we no longer have a football team in town I root for the Houston Texans. As part of our psychological support we get music, movies, books, TV shows, etc. sent up to us when possible. This week I received an Angels game that was probably a few days old. It was great. I could watch an inning or two while having a meal and then maybe a couple more before I went to bed. It took me about 2-3 days to watch a game and I enjoyed every minute of it. So what do I miss? Being a Lakers fan anywhere but in LA is tough, especially in Houston where you have Dallas and San Antonio fans. I miss the banter with my buddy Rene about which team was going to win when they faced each other (both our teams lost so we would not get the chance this year anyway) and why the players on our teams are far superior than others. I miss watching an Angels game with my sister – I live in Houston and she lives in Anaheim and yes we call each other after or during the significant events of each inning. The Kings are in the Stanley Cup Finals and are one game away from winning their first Cup. How cool would that be? I can only imagine how my friend Ken is feeling after the last 2 losses. The Heat beat the Celtics in game 7 and will now face OKC. That is going to be a great series. Don’t get me wrong. There is no place I would rather be than working aboard the ISS. It has just given me an opportunity to reflect on why certain things are important to us. I am sure those serving our Country abroad, or those stationed in Antarctica or any other remote area have felt the same. 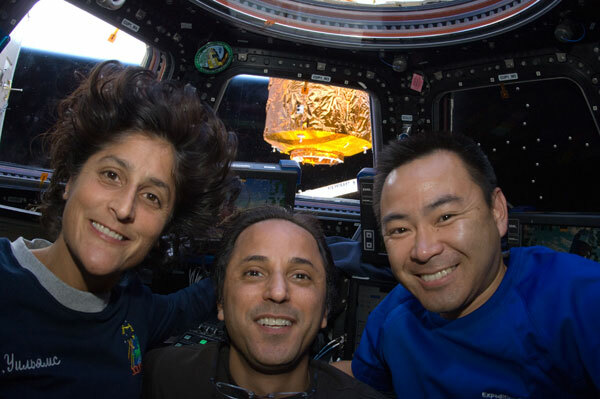 I look forward to the arrival of my crew mate Suni Williams in about a month. She is a Red Sox fan. So if you hear anything as the ISS flies over your city, it is probably her and me watching an Angels – Sox game and talking smack over who is going to win. I think we all know the answer to that one. I was going to say this has been another busy week, but I think I would be able to start every entry this way. All of the Mission Control Centers (Houston, Huntsville, Munich, Tsukuba and Moscow) do a great job of maximizing our time on orbit in order for us to live and work efficiently. This week ended the milestone Dragon mission. Our main tasks were to unload and then repack the vehicle for its return trip and then send it on its way. We worked really well as a team and finished ahead of schedule with the packing. After finishing that, our focus shifted to the un-berthing of Dragon and releasing it from the Space Station. There is a lot of work involved with closing the hatches between Dragon and the Space Station and installing the controllers for the mechanisms that hold these two together. It is not as easy as just closing a couple of doors. Due to the fact there was an approximately 30-minute window for the actual release of Dragon, we had to get up a couple of hours earlier than normal. Luckily I am a morning person so that was not too painful. Just like the Capture, the Release went as planned. 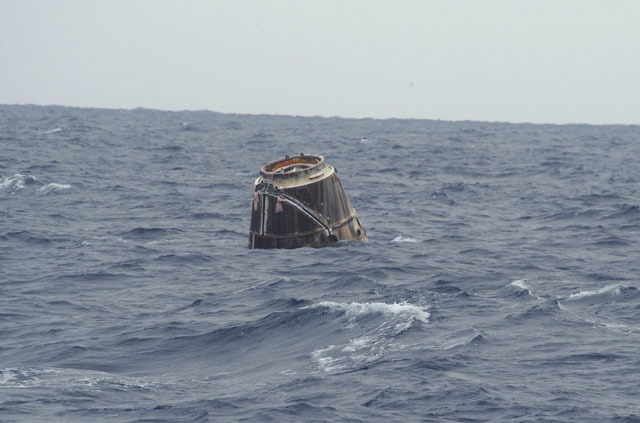 The cool thing about Dragon is that about 5 hours after we release it, it is taking its plunge into the Pacific Ocean. Again, it was great working with Don and Andre and the Control Centers in Houston, TX and Hawthorne, CA. 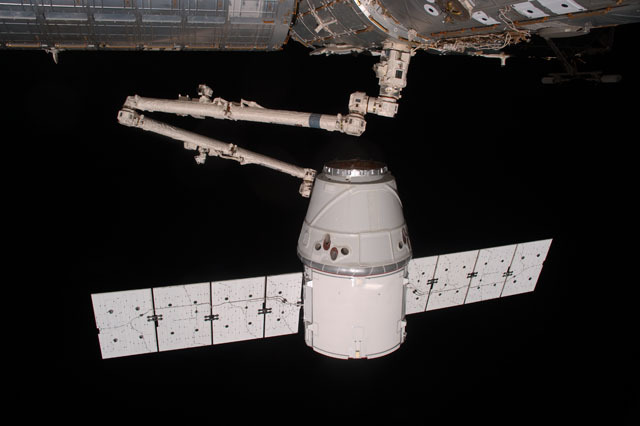 The SpaceX Dragon cargo craft is about to be released by Canadarm2 robotic arm on May 31. Apart from Dragon, I had a lot of medical tests and data collection to do. We do Periodic Fitness Evaluations where we put on some electrodes and a blood pressure cuff while we ride the stationary bike. Not only is it good to see how we are medically doing, but it also provides information on how the body may change while on orbit. As part of another experiment I had to eat a special diet for 4 days and part of the deal is that you need to eat everything they put on the menu (If you can’t eat it all, you just need to let them know so they have a very accurate account of what you consumed). 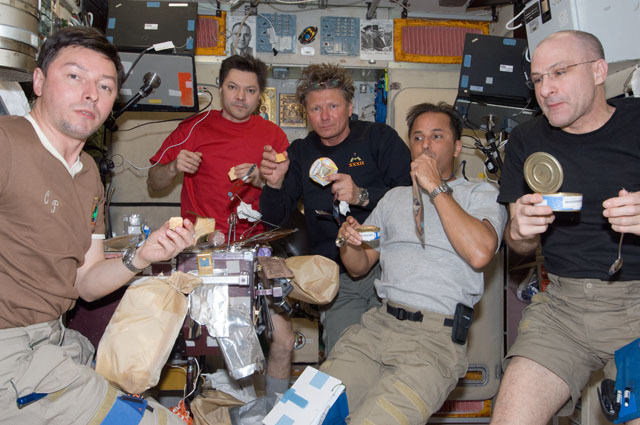 It is very interesting because they are looking at how our diet may affect bone density while on orbit. This could be very important when we plan on very extended missions to places further than low Earth orbit. As part of this and a couple of other studies, I had to collect my urine for 24 hours, spin the samples in a centrifuge and then place them in our -80/-90 degree Celsius freezer. I am sure most people have had to give urine samples before while visiting a doctor or hospital. No problem, right? 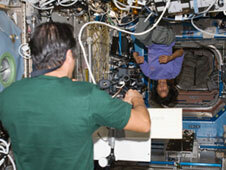 Without getting too graphic, it is no easy chore to urinate into a bag while in microgravity. It does take up a good part of your day. To finish off the successful week, I had to have blood drawn on Friday morning. Luckily Andre is a doctor and he did a great job. We do train however to draw blood from ourselves. I don’t do well with blood, so it was a big achievement for me to do that as part of our training in Houston. One of the many cool things about being is space is the wide variety of tasks we get to do every week. I look forward to seeing what is in store for me in the future. 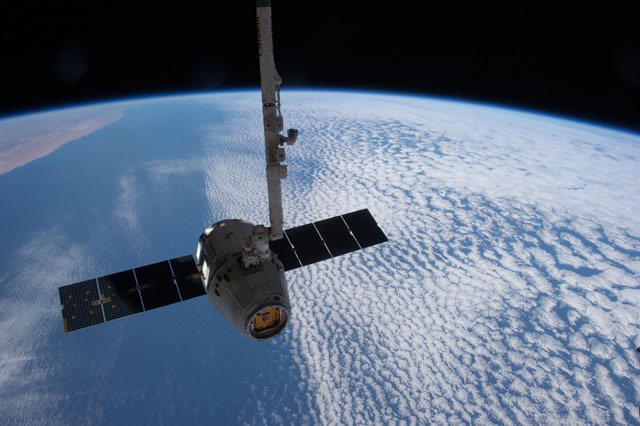 The SpaceX Dragon splashed down May 31 at 11:42 a.m. EDT west of Baja California, Mexico. NASA worked with Marvel and Disney to get The Avengers sent up to us. While in Russia, I missed the opening of this movie by less than a week. I am a big comic/superhero fan and had been looking forward to seeing it. Once I knew we were getting it, I told the crew and we got together on Saturday night for a movie night. How cool is it to watch The Avengers while in space? That is one movie viewing I won’t forget. Thanks to NASA, Marvel and Disney for providing us with a nice evening and a chance to relax at the end of great week. So I have been on the ISS now for almost 2 weeks. While the time has flown by, it also feels like our launch was so long ago. I think we have all experienced these types of time warps. It has been everything I expected and more. It is funny that we train for over 2 years for a flight and I feel very comfortable with any technical tasks that I may have to do and it was the daily routine/personal items that has been the most overwhelming. It was the simple things: where do I find clothes, what is the best technique for using the bathroom, how do I set up my personal sleep station, etc that really worked my brain. The only way to learn all of that is by being here and relying on the patience and experience of the your fellow crew mates. Don and Andre have been great. I will always be grateful for their assistance. Now that I am settled in and comfortable, I can now focus on the science and maintenance that we do during our work days. Of course the big story so far of my short time period onboard, has been the arrival of Dragon. I congratulate the SpaceX team for their monumental accomplishment. Since my original launch date was delayed by 6 weeks and Dragon was scheduled to arrive before me, Don and Andre had trained onboard as a 2 person team. They had a great game plan. With very consistent training in Houston, I was able to assist and fill holes as needed. It was too cool the first time we caught sight of Dragon. As it got closer and closer, it just became more and more amazing. The grapple and berthing went without a hitch. Even though we are very well trained, there was quite a bit of relief onboard after our tasks were complete. We gathered as a crew that night for a group dinner to celebrate. Things that are memorable up here: floating (you never get tired of that, it is like a dream), group dinners and stories around the table, working on science experiments that can only be done in a micro-gravity environment, reading a book while positioned in the Cupola with the Earth as a backdrop, working out and while doing bench press staring at Earth (I think if more people had that view while working out, we would make it a higher priority), sleeping in the vertical….. The list will grow with every passing day. I am grateful every day for this opportunity. Everything is progressing well towards our launch on May 15 at 09:01 am local time in Kazakhstan. We had a chance to see our vehicle one last time, now all packed with the cargo we will take with us to the International Space Station. She looks good and is ready for us. The fully assembled vehicle has been transferred by train and with a well rehearsed and proven procedure, has been placed in its final position on the launch pad. <?xml:namespace prefix = o /> People ask what does one do a few days before launch? There are of course a few briefings, but they are kept to a minimum. We discuss the details of our launch and rendezvous with the ISS and the current status of the ISS, if any changes have occurred while we have been in Baikonur. Some time is set aside to meet with our respective management representatives. The work that is done to put together a successful mission is enormous. It is with great appreciation that we are allowed to have brief contact with immediate family members. None of us would be where we are without the love and support of our families. All of the Astronauts and Cosmonauts know that the stress of a launch is much more difficult for them. We are trained, know what to expect, and get to experience the unforgettable thrill of a launch to space. We thank them for their support and sacrifices. No special requests for meals are made. We are well fed in Baikonur within their regular menu and we couldn’t ask for more. As I think about it, the more you can keep a normal routine leading up to an important event, the more relaxed one feels. We will be getting up around midnight the evening before launch, so the day before is short as we will try to get some sleep after lunch. As a crew, we are well rested and ready. I look forward to sharing our story with you with future blogs from The Great Outer Space.